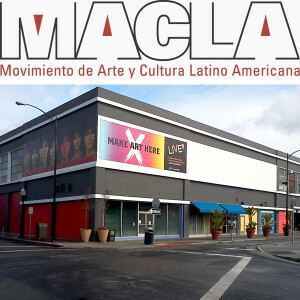 MACLA/Movimiento de Arte y Cultura Latino Americana is an inclusive contemporary arts space grounded in the Chicano/Latino experience that incubates new visual, literary and performance art in order to engage people in civic dialogue and community transformation. More than 30,000 children, youth, young adults, families and community residents participate in the fifty programs MACLA produces each year in four core program tracts.Â These are Visual Arts, Performance and Literary Arts, Youth Arts Education, and Community Development Through the Arts. The cross-pollination of Latino and non-Latino audiences has been a distinctive feature of MACLA since its inception. The patrons, audiences, and participants are 70% Latino and 30% non-Latino. A large part of the programs are geared towards creating opportunities for interaction between traditional audiences and new art forms and emerging artists. Building upon a long history of neighborhood youth arts programming, MACLA teamed up in 2011 with The Black Eyed Peas Peapod Foundation and the Adobe Foundation to start the Peapod Adobe Youth Voices Academy (PAYVA). This model enriched MACLA’s original platform by increasing its regional and national visibility as well as providing additional resources for teaching, production, and performance. This year, continuing on the success of its three years as PAYVA, MACLA is pleased to launch the brand-new DMC Studio at MACLA. DMC Studio is a free arts education program in San Jose, CA, dedicated to mentoring Silicon Valley youth (ages 13-18) in 21st century skill development through multimedia production. The highly selective, year-round program focuses on a range of disciplines, including professional video and sound production, visual and performing arts, and photography. Summer and after-school workshops range from individual to group-based projects and are taught by experienced industry professionals in a state-of-the art studio environment. In addition, the studio provides youth with a venue for the exploration of relevant social, personal and community issues. It encourages youth to engage in community dialogue, develop their artistic voices, become cultural innovators, and discover how art is used for social change. Because of its latest digital technology offerings, variety of workshops, and multidisciplinary, hands-on approach to digital literacy, DMC Studio provides youth with artistic, technical, and practical work skills and experience to prepare them for college and beyond. Our availability follows the San Jose school district academic calendar. Open Lab Drop-In Schedule Monday-Friday from 4pm-7pm. No experience or equipment needed. We provide industry standard production equipment! The DMCStudio at MACLA also offers customized paid classes for multiple institutions providing arts education through intensive workshops that teach 21st century skills. The multi-disciplinary courses can be taught on or offsite and include: Music Production, Video Production, Photography, Hip-Hop and Spoken Word. Price varies per discipline and number of students.